Baker, Braverman & Barbadoro P.C. is a Quincy MA law firm representing clients in matters involving litigation, business/corporate, real estate, elder law/estate planning, divorce/family law, employment, finance, probate, criminal defense, tax, bankruptcy and election law. 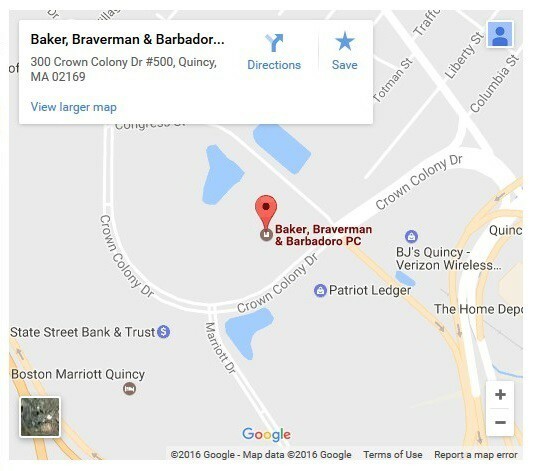 Baker, Braverman & Barbadoro, P.C. is a dynamic full service law firm committed to providing every client with personal attention and superior legal service. From our centrally located Quincy office, our lawyers have been providing legal advice and counsel to individuals, families, businesses, lending institutions and real estate developers for over thirty years. Our team of talented attorneys maintain a broad spectrum of skills in order to guide our clients through the complexities of today’s ever changing legal landscape. We believe that community involvement is not only an ethical obligation but one that is essential to our standing as a full service firm. In addition to smaller organizations and activities in which our staff participates, the firm has maintained its commitment to support various charities with our time and expertise. Our attorneys have served in numerous capacities such as Zoning Boards, local finance committees, charitable foundations and council on aging committees. Through our community service we have been privileged to help out organizations such as Easter Seals, American Diabetes Association, March of Dimes, The Leukemia and Lymphoma Society, South Shore YMCA, Striar Jewish Community Center and Juvenile Diabetes Research Foundation. Baker, Braverman & Barbadoro attorneys have lectured on a wide range of legal issues from estate planning to civil and criminal litigation, Elder Law, land use and other topics at seminars, colleges, high schools, Bar Associations and on radio shows.